Usually a stock or an equity etf drops by the amount of the dividend on the ex dividend date. Does the same rule apply to a bond fund or bond etf? When a bond etf pays the quarterly dividend because the underlying bond(s) pay out coupons, will the bond etf also drop by the amount of dividend? Stock funds and bonds funds collect income dividends in different ways. Stock funds collect dividends (as well as any capital gains that are realized) from the underlying stocks and incorporates these into the funds’ net asset value, or daily share price. That’s why a stock fund’s share price drops when the fund makes a distribution – the distribution comes out of the fund’s total net assets. With bond funds, the internal accounting is different: Dividends accrue daily, and are then paid out to shareholders every month or quarter. Bond funds collect the income from the underlying bonds and keep it in a separate internal “bucket.” A bond fund calculates a daily accrual rate for the shares outstanding, and shareholders only earn income for the days they actually hold the fund. For example, if you buy a bond fund two days before the fund’s month-end distribution, you would only receive two days’ worth of income that month. On the other hand, if you sell a fund part-way through the month, you will still receive a partial distribution at the end of the month, pro-rated for the days you actually held the fund. It may be true for a bond fund. But it is not true for bond etf. Bond etf will drop by the same amount when it distribute dividend on ex-dividend date. Most bond ETFs have switched to monthly dividends paid on the first of each month, in an attempt to standardize across the market. 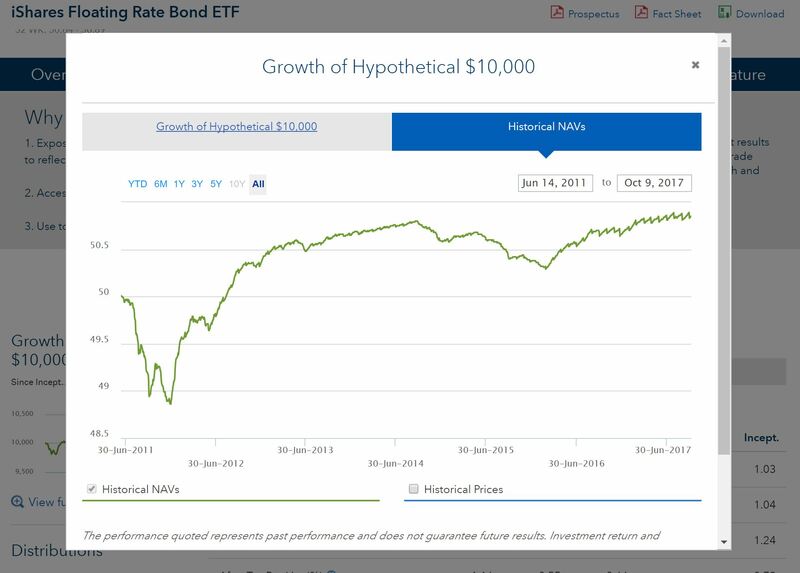 For ETFs (but perhaps not bond mutual funds, as suggested in the above answer) interest does accrue in the NAV, so the price of the fund does drop on ex-date by an amount equal to the dividend paid. A great example of this dynamic can be seen in FLOT, a bond ETF holding floating rate corporate bonds. As you can see in this screenshot, the NAV has followed a sharp up and down pattern, almost like the teeth of a saw. This is explained by interest accruing in the NAV over the course of each month, until it is paid out in a dividend, dropping the NAV sharply in one day. The effect has been particularly pronounced recently because the floating coupon payments have increased significantly (benchmark interest rates are higher) and mark-to-market changes in credit spreads of the constituent bonds have been very muted. Not the answer you're looking for? Browse other questions tagged bond-funds ex-dividend-date or ask your own question.